A returning UNIFIL veteran from The Netherlands photographs a serving Finnish peacekeeper about to set off on a patrol. UNIFIL Head of Mission and Force Commander Major General Michael Beary salutes a group of Dutch veterans during a ceremony for fallen peacekeepers held in Naqoura. Flanked by a UNIFIL Irish veteran and a representative from Tibnin Municipality, UNIFIL chief, Major General Michael Beary, lays wreaths to honour fallen Irish peacekeepers in Tibnin. UNIFIL chief, Major General Michael Beary, greets a veteran UNIFIL peacekeeper from The Netherlands in the UNIFIL headquarters in Naqoura. UNIFIL Head of Mission and Force Commander Major General Michael Beary chats with an Irish veteran after the ceremony honoring fallen Irish peacekeepers in Tibnin. UNIFIL Irish veteran, John Molloy, and Major General Michael Beary, share a moment after a group photograph with Irish veterans in Naqoura. The ability of veteran UN peacekeepers returning to a UN peacekeeping mission is a strong indication of the increased security and stability of the region they served during hard times. Their regular visits can also be explained by the strong bond they developed with the host communities. In the past few years UNIFIL civil affairs office has facilitated many visits of UNIFIL veterans to south Lebanon. These retired peacekeepers come from as far away as the Netherlands, Sweden, Ireland and Norway. 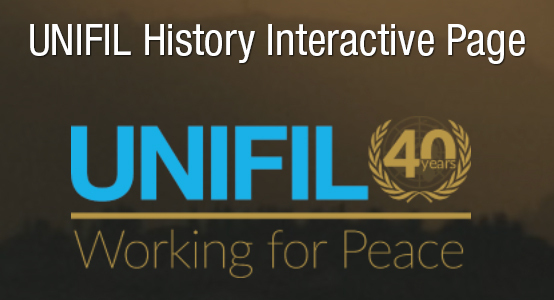 Some have not been here since UNIFIL was established in 1978, others served during times of conflict in the 1980’s and ‘90’s. All of them remark on the socio-economic development south Lebanon has witnessed, facilitated by the past 12 years of calm. UNIFIL Head of Mission and Force Commander Major General Michael Beary met with each of the visiting groups. He remarked, after meeting one of such groups, that it’s wonderful to see them coming back and seeing the change.